Vampires, bats and gargoyles provide the ominous theme for Slotland’s new Jewels of the Ancients slot machine. The ghoulish new 19 pay line slot machine has jewels, treasure maps, mystical goblets and even vampire-slaying garlic spinning on its five reels and has a Bonus Game for extra playing time and extra cash prizes up to $1000. Slotland, one of the first and still most popular online slots sites in the world, has a special bonus and a free contest to celebrate the launch of its twentieth one-of-a-kind game. Three Full Moon symbols trigger the bonus round on the new Jewels of the Ancients game. (The moon is a scatter symbol and pays out no matter where it is located.) In the bonus game, players turn over cards trying to reveal as many different Bonus Symbols as possible. Collecting all six golden symbols – a bat, fallen angel, gargoyle, ankh cross, Nosferatu the Vampire and Dracula -- wins $1000. It helps to get as many special gold Bonus Symbols during the main game as possible since any that appear on the slots reels are automatically revealed at the start of the Bonus Game giving a head start and increasing chances of winning the bonus cash. 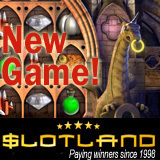 Slotland.com has been offering one-of-a-kind online slot machines and video poker games for more than twelve years. There are now 20 instant-play casino games to choose from – none of them found at any other online casino. This provides a unique and fun entertainment at home. Now you wouldn't have to drive all the way to casino just to have fun.